Happy 9yrs 8mths of getting to know you. Hey Readers!! Do you remember a time, not so long ago, when I had my first solo makeover photoshoot with this great duo called Spacefifty? Let me take you back to....... My Spacefifty Makeover Photoshoot in March 2010. A few months passed. And when I found out I was pregnant with our first child, I was elated! I wanted it to be documented as artistically as possible for memory's sake. This way, as our family progresses way down the road, we could still look back and reminisce the times we had before our lil babygirl was born. We booked a maternity photoshoot session with Spacefifty again as I was really impressed by their work. Zahila, make-up artiste, Cosmoprof trained, and her husband Shah Reza, the professional photographer, make a really great duo. They researched thoroughly and come up with interesting ideas before the photoshoot so that you will feel comfortable on that day. During the photoshoot day itself, they worked hand in hand as artistic producers and let you feel at ease as they joked around with you while you pose. 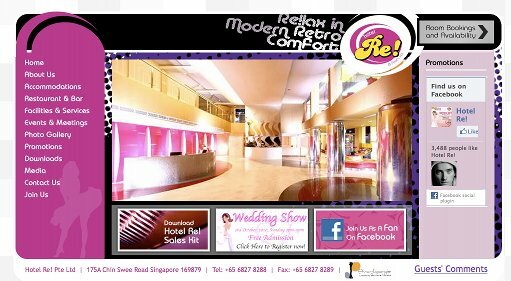 Do visit http://www.spacefifty.com for more information and on the packages they are offering! It was a great sunny afternoon where the photoshoot was to be taken place at the Botanical Gardens. 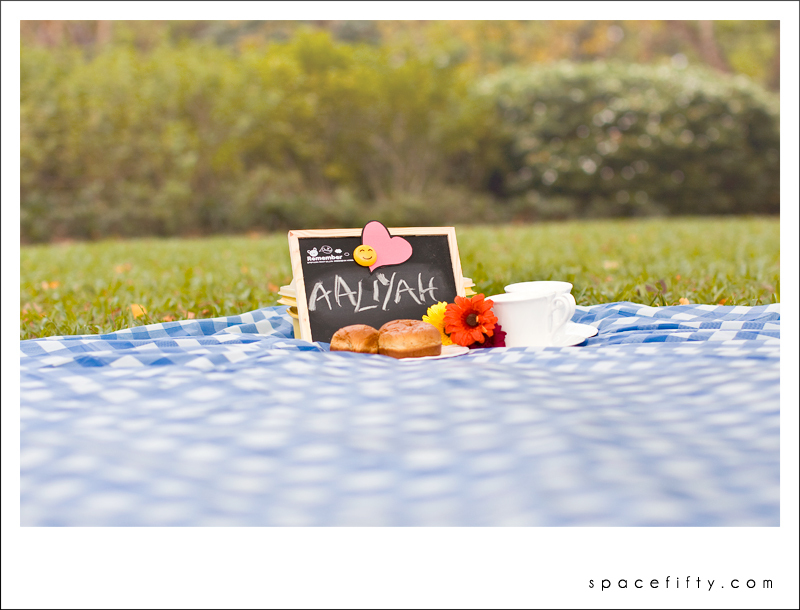 Zah and Reza had planned a real picnic there with real food and props. The sun was setting but it just had to rain during sunset. What luck! Nevertheless, Reza still managed to capture the moments of myself and Hon together despite the dark and gloomy weather! I finally leave you with the photos from SheZai's Photoshoot with Spacefifty. As with all things great, presentation is also key. 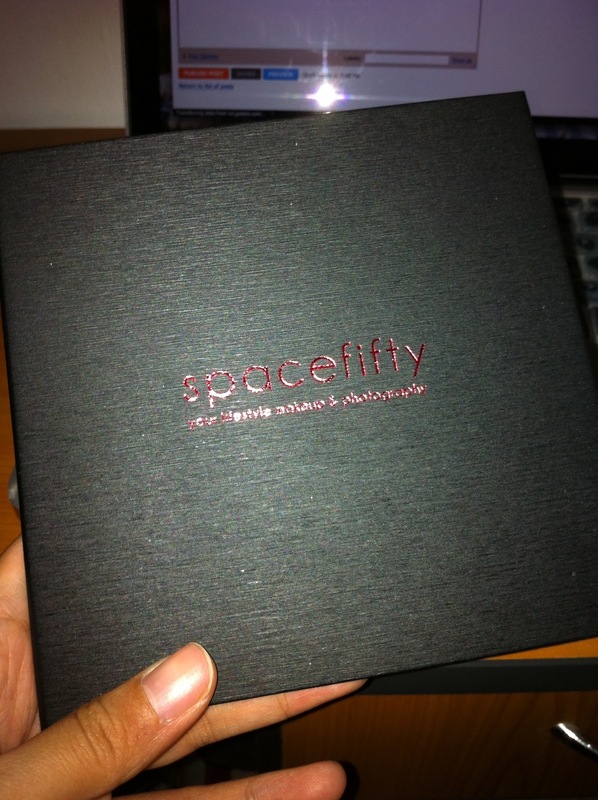 What we got from Spacefifty was a really neat looking CD in a really awesome looking CD cover! Professional, yea! What made me intrigued was the fact that they are focused on LIFESTYLE makeup and photography. Need a studio makeover? 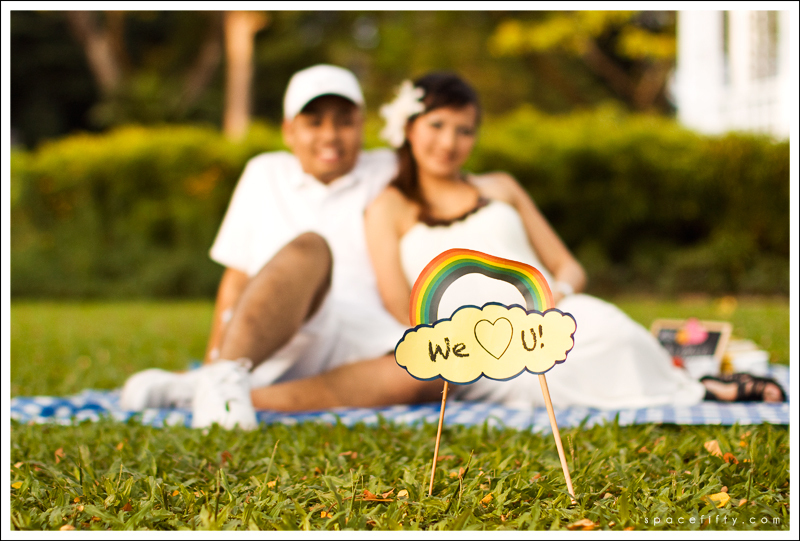 Need a wedding or engagement photoshoot? Just feel free to SMS or call them up! Overall, SheZai had a fantastic time with Spacefifty. Thanks Zahila and Shah Reza! P/S: They also happen to be our great fantabulous neighbours! Don't forget to visit their website and take a look at their packages! 6 more days till full term (37 weeks). I am starting to feel Braxton Hicks contractions already if that is what it is. Her moves are getting very violent now, especially when I am hungry. It's like her way of telling me, "Mummy! Feed me! I am hungry!" Strong waves and sometimes the little elbowing and kicking here and there which tickled me and made me laugh to myself. I have been sleeping well on my side throughout the night only to wake up with the tummy in a weird shape, like gravity pulling down one side of it. But it gets back into shape once i stand up. Guess there is still space in there for baby. Everything is prepared. From the hospital bag and documents to the stroller and crib. The one think I am not prepared for is what to expect. I will be starting my leave next week to just take a rest at home and keep my mind off work's physical stress. And then it's the waiting game. Waiting for the bloody show, contractions, burst of waterbag and zoom I will be off to the hospital. I will still try to keep myself active by taking walks around my estate. Jitters of being a first-time Mom has hit me. Hon seems to be doing well in waiting to be a first-time Dad. There is a lot to learn, a lot to experience. InsyaAllah we will make it through strong-willed. 4 more days and i'll be in my 9th month! Baby Aaliyah has been very cooperative and great! She deserves a big present for being a strong gem in my tummy. At 9 months, I am still walking like normal, still bending down and up picking up things, still working with my class of 14 3-year-olds, still going on hot dates and movies with Hubby dearest and still feeling really awesome and energetic!! *Maybe the iron pills that Doc slipped me are suspiciously power-pills! * haha! And on the 25th November, we have 3 occasions to celebrate! And IF lil Aaliyah were to pop out on this date, whooaaa boy! I'll be pokai lor! 4 celebrations on one day, incuding Aaliyah's birthday! hahaha! We'll put up reviews on our staycation soon! Stay tuned! On another note, we had a marvellous maternity photoshoot session with our dear kind friends at Spacefifty, Zahila and ShahReza! I love their works! Really stunning! Here is a preview of one of the photos Shah took of us with Zahila as the make-up artiste. Stay tuned to see the whole maternity shots album! Baby Aaliyah has grown to 35 weeks this coming Monday. She is one active babygirl, and i love it! I went for my umpteenth check-up yesterday and Doc says everything's going great! She is now 2.3 kg while her mummy is still at 55.5 kg. =) I just need to eat more iron pills so that i won't have a 'bloody' labour, according to Doc. He asked me to eat meat everyday. Become a barbarian. So what is this mummy feeling right now? Anxious? Relaxed? Jittery? Worried? The feelings are all mixed up in a bowl of tossed salad. As in weddings, there are still the nitty gritty details that needs to be taken care of. Like... washing of baby's clothes with baby detergent, buying a baby clothes wardrobe, unpack baby stuffs and stuff it in said wardrobe, unpack the stroller (again) which still lies in its box, redecorate room with baby stuffs. I have just pre-admitted (or was it pre-registered) myself to the hospital yesterday. So when the time comes, I will straightaway head to the labour ward in any case of emergency. I will be due in mid-Dec (40 weeks), however, as a lot of 'they say' quoted, it could be earlier i.e. 37 wks onwards. So, roughly, i will be full term in 2 WEEKS TIME!!!!! ok ok, kanchiong already. Seeems soo fast! I have been watching a lot of 'Discovery Health and Living' on Starhub channel 425. A LOT of labour and pregnancy stories and information has been absorbed into my brain. But i know that when the time comes to push, all that will seem far far away, I know that it feels like, just get this baby out of me! I don't know how contractions will feel like, I don't know how epidural will feel like and if I could withstand the pain enough not to have it, I don't know what will happen. So if you were to ask me, yes, as much as I want to bring Baby Aaliyah into the world, I still do want to experience as much as I can, this feeling of being pregnant. It is a miracle. There are no photos in this post. But do stay tuned for my maternity shots with our good friends from Spacefifty! !